Perfectly smoky BBQ bacon & pineapple skewers. So today I’m teaming up with 4 other bloggers to bring you a collection of recipes that are perfect for summertime BBQs! 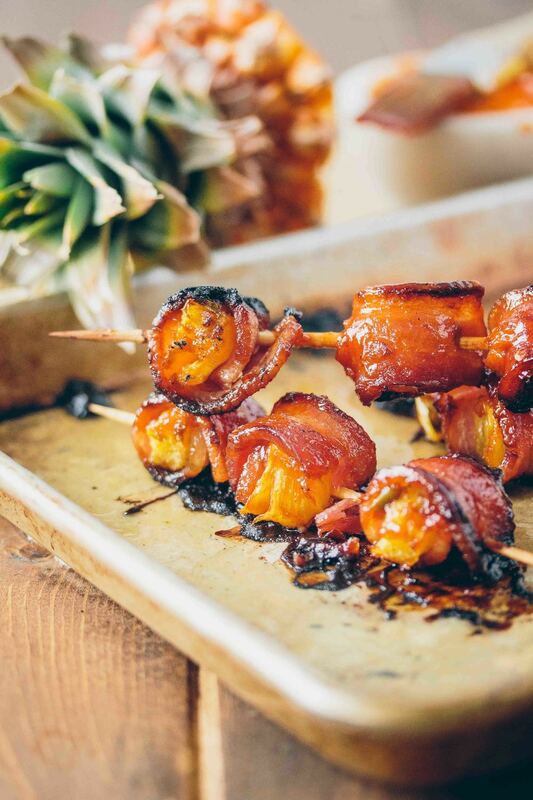 My contribution consists of the easiest bite-sized burst of flavor: BBQ Bacon-Wrapped Pineapple. And when it comes to ranking bite-sized bursts of flavor, I’d place this in a close to second to bacon-wrapped dates (but it’s a close race). As for how I’ve taken it up a notch? A slice of nacho-style jalapeno tucked inside. A little bit of spicy to balance out the sweet and smoky. I did half the skewers with BBQ sauce glazing and half with my husband’s favorite hot sauce (and saved those for him since I don’t care for too much spice). Both were declared winners so you can’t go wrong, whichever you choose. I roasted these in oven – with skewers to keep everything tucked together – so that the bacon would caramelize evenly. But I’m pretty sure that if you wanted to grill them, it would work equally well. I do it with bacon-wrapped jalapeno shrimp like once a week and it’s delicious! Keep reading for links to the other 4 recipes below! To complete your BBQ menu, you should most definitely head over to the other 4 recipes! Everything looks so delicious. Soak 4 skewers (or less, depending on the length) in filtered water for 1+ hours before making these. Preheat the oven to 400F. Line a baking sheet with parchment or aluminum foil. Slice the bacon in half to yield 12 pieces. Stack a jalapeno slice on top of a cube of pineapple. Wrap with a piece of bacon and skewer it through the end of the bacon to hold everything in place. Continue with the remaining ingredients. Lay the skewers on the lined sheet pan. Brush liberally on both sides with your choice of BBQ sauce or hot sauce. Bake for 20-25 minutes, or until the bacon is browned.